The ALL-AWARE is He from Whom nothing is hidden whether on earth or in heaven; the ALL-AWARE is He Who knows every movement, the apparent and the hidden aspects of things. When omniscience intermingles with the inmost secrets of things then the result will be all-awareness, which iskhibra in Arabic; the Master of All-Awareness is Allah, Hesays, “..and He is the Wise, acquainted with all things.”(AN‘AM, 18), “Ask thou, then, about Him of any acquainted with such things.” (FURQAN, 59) “..soon will I bring you from there some information.” (NAML, 7). 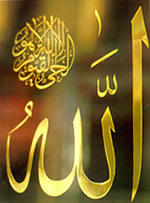 The Arabic word khabar means in English, the announcement and information with which a speaker mentions a certain event, “And how canst thou have patience about things about which thy understanding is not complete?” (KAHF, 68), “God hathalready informed us of the true state of matters concerning you.” (TAUBA, 94), “Should He not know, He that created? And He is the One that understands the finest mysteries and is Well-acquainted with them.” (MULK, 14). Allah is the the ALL-AWARE, Praise and Glory be to Him, He is Allah.